The impostor who fooled Stanford University this year - sleeping in dorms, attending class and studying for exams - might seem particularly brazen, but it's not the first time good-hearted people fell for a good story. 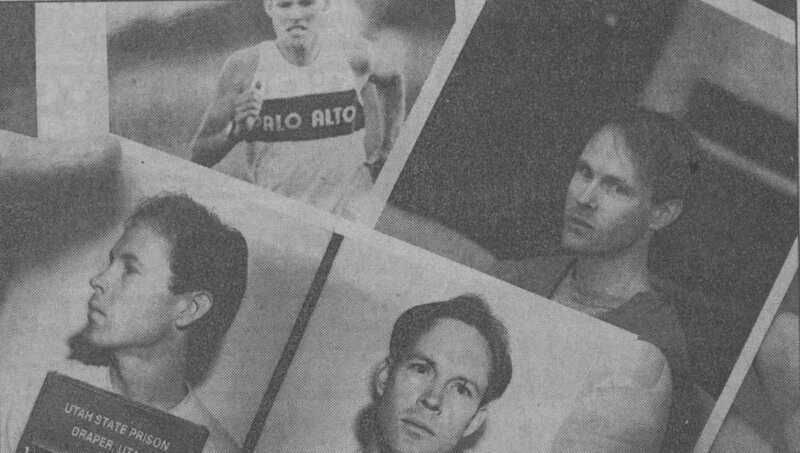 More than two decades ago, a young man from Kansas used a fake name and story to run track at Palo Alto High School, then Princeton University. In the Colorado ski towns of Vail, Aspen and Telluride, James Arthur Hogue hid his true life history as he stole both identities and property. But Hogue's life of elaborate self-invention is ending at a Colorado state prison, where the frail 47-year-old last month started serving a 10-year term for theft. "It's very sad," said Harvey Palefsky, the public defender who represented him against his Colorado theft charges. "It's a waste of a lot of potential. "He was bright enough, and athletic enough, that if he had gone about it the right way, he could have gotten what he was seeking." At his mountain home, Colorado police say, he variously misrepresented himself as a geologist and a native of Wyoming with a chemical engineering degree, a lucrative patent and a wife in Aspen. He also accumulated enough stolen items to fill a flea market, including moose antlers, medical books, stuffed bears, bicycles, red-silk high heels, rare wood, copper pans, power saws and champagne. "It's hard to explain why I do this," a shaken Hogue told District Judge James W. Schum, before being sent off last month to Four Mile Correctional Center in the remote Rocky Mountain town of Canon City. "It's nothing that I can really understand myself." Hogue's facade-building began in 1985 when the 26-year-old showed up at Palo Alto High pretending to be a self-educated, 16-year-old orphan named "Jay Mitchell Huntsman" who had been raised in a Nevada commune. He attended four classes a day and excelled on the varsity track team. Like Azia Kim, the 18-year-old Fullerton woman who put one over on Stanford, Hogue failed to arouse the suspicions of students, teachers or school administrators. Local sportswriters, intrigued by his background and speed, dubbed him "Mystery Boy." He told classmates that his goal was to win a track scholarship to Stanford. When he won the prestigious Stanford Invitational Cross Country Meet as a member of the Palo Alto High cross-country team, a local reporter checked birth certificates - and discovered that the real Jay Huntsman had died in Southern California in 1969 at 2 days old. Hogue quietly left Palo Alto High. Six months later, Palo Alto police arrested him for forging checks, and he was given a 90-day jail sentence. A bench warrant was issued for his arrest after he violated his probation. Then he dropped out of sight. He surfaced briefly in Vail, Colo., where he taught running at Jim Davis' cross training camp - posing as a Stanford professor in biomedical engineering. Three years later, an application for "Alexi Indris-Santana" arrived at Princeton. The Ivy League school accepted the student who had described himself as a self-educated 18-year-old ranch hand from Utah who ran barefoot in the desert - and even offered scholarship money. But only his impressive 1410 SAT scores - and under-4-minute-mile time - were real. He deferred enrolling for a year, telling Princeton officials his mother was dying of leukemia in Switzerland. Hogue was really in prison in Utah for the possession of $20,000 in stolen bicycle tools. "Indris-Santana" flourished at Princeton. He earned strong grades, good friends and membership into the Ivy Club, a prestigious private eating club. He worked at a summer job on a university grounds crew and helped lead the freshman summer orientation program. But he was again exposed - again at a track meet. At a February 1991 Ivy League competition, Hogue, by then 32, was recognized by a Yale senior who had attended Palo Alto High School. Princeton was notified, and Hogue was arrested during a geology lab. Hogue pleaded guilty to theft, but while awaiting sentencing, he continued his studies by enrolling in a Harvard University extension program. He eventually got nine months in jail for fraudulently taking nearly $22,000 of Princeton scholarship money. "A lot of classmates felt that he certainly deserved that education, but he didn't go about it the right way," said public defender Palefsky. In 1996, Hogue was back at Princeton, this time posing as a grad student named "Jim MacAuthor." He was recognized and charged with trespassing. Released, he headed west to Aspen, where he is remembered for running in a pullover argyle sweater vest - and stealing a bicycle and a bottle of Rogaine in 1997. He landed in jail again. After moving to the Telluride area, Hogue was known as an introverted but charming carpenter who spoke Russian and Italian, ran fast and skied expertly. He lived alone in the fading mining town of Bernardo, in a rough-hewn two-story home with plastic tacked on the porch. Once he visited Russia with other bachelors to seek a wife, later returning to the country to visit a woman whom he planned to marry. Soon people in the affluent enclave of Mountain Village, a resort in the town of Telluride, began to report missing items. Hogue's fairy tales succeeded despite a widely shown 2001 HBO documentary about him called "Con Man," made by a Palo Alto High School graduate. Last year, Hogue was arrested - while on the lam in Arizona - for his Colorado thefts. Police said that they believe that Hogue was planning to travel to Russia, possibly to pose as a doctor. In a stolen laptop, he had CDs of medical instruction. He also had a passport and $1,200. In his house, police found a secret door to a room with 80 pieces of stolen wood and equipment, according to the Telluride Daily Planet. The once-handsome man - whose real life started in Wyandotte County, Kan., with a father who worked on the railroad and a mother who stayed home with him and his three older sisters - arrived to his sentencing hearing in May looking pale and unkempt. Wearing handcuffs that chained his hands to his waist, his hair stringy, Hogue showed no reaction as he was sentenced to 10 years in state prison, the newspaper said. Judge Schum said the 10-year sentence was an attempt to get Hogue's attention. "This is apparently some sort of mental illness you suffer from, some sort of obsessive personality trait that you have, but it's offensive and threatening," Schum said. "And it has to be stopped." Facing jail, Hogue's biggest worry wasn't his imminent fate - but what to tell the Russian woman he had hoped to marry, he told his nephew in a taped phone conversation. So he made up yet another story. "Tell her I was killed in a car crash or in a coma," he said. "I don't anticipate having my life anymore."